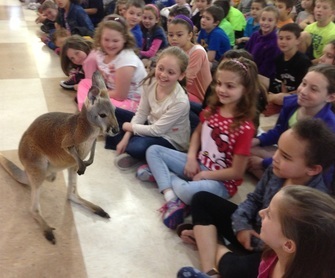 Since 1987 Records and Burpee have presented the very best in live animal encounters to hundreds of schools throughout New England. We now offer this program to outdoor venues including fairs and special events. Our experience as trainers enable us to demonstrate the animal’s agility, intelligence and adaptations in a show that is educational, fast paced and lots of fun. A typical program includes two 50-minute programs and 7-9 animals such as the following: kangaroo, tortoise, squirrel monkey, large python, colorful macaw and others. All showtimes subject to change due to weather.